Owners of Blue Bell Creameries LP have agreed to pay a fine in Texas in relation to a deadly Listeria outbreak, but possibly more significant is that health officials will have the company on a short leash for 18 months. The agreement between Blue Bell and the Texas State Department of Health Services requires the company to pay $175,000 within 30 days of the signing of the agreement. Another $675,000 — for a total fine of $850,000 — must be “held in abeyance” and would go to the state if Blue Bell fails to meet food safety requirements in the coming 18 months. Blue Bell’s president and CEO Paul W. Kruse signed the agreement July 22. Representing the state, Kathryn C. Perkins signed it Thursday. If Blue Bell makes it through the 18 months without problems, the state will not make the company the remaining $675,000 of the $850,000 fine, according to the agreement. Ten people were hospitalized across four states, and three died, in the outbreak of Listeria monocytogenes infections traced to Blue Bell’s production plants in Brenham, TX, and Broken Arrow, OK, from January 2010 through January 2015. Listeria monocytogenes was found in those plants as well as Blue Bell’s Sylacauga, AL, plant No illnesses were linked to the Alabama plant. Seattle food safety attorney William Marler said Friday that he would not be surprised if Oklahoma and Alabama officials take similar action. 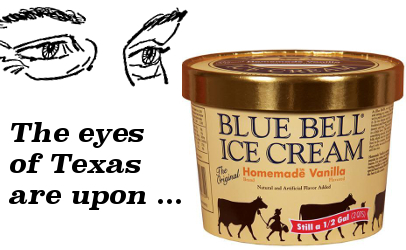 “The most important point about the fine in Texas is not the fine, but that it puts them (Blue Bell) under the jurisdiction of Texas for 18 months when they will be watched like a hawk,” Marler said. The Blue Bell plant in Texas is under the close scrutiny of state officials for at least the next 18 months.